I hope you all had a wonderful Memorial Day weekend! I was lucky enough to spend it with loved ones. Unfortunately, there was a lot, and I mean a lot, of rain throughout the weekend. We definitely made the most of it and still had a great time. It is all about the company! 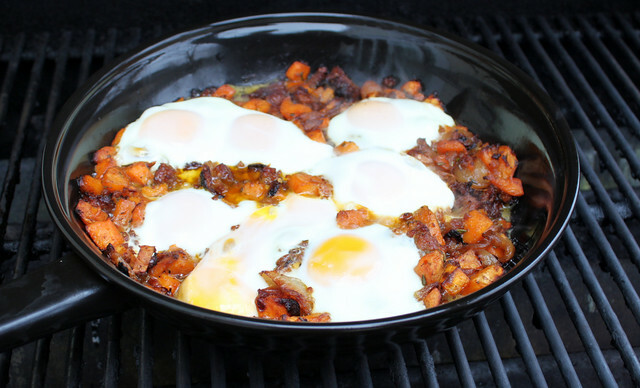 There are so many good things about this recipe including sweet potatoes, sausage, caramelized onions, it is made ahead of time, and is versatile. I figured out the versatile thing firsthand. The hash component is made the night before and stored in the refrigerator overnight, so it lends itself to quick prep in the morning. I made this when I was home for Easter and the plan was to cook it for breakfast in a 9x13 baking dish in the oven. When I woke up that morning I realized the ceiling fan had stopped, the clock was dark, and the house was very quiet. The power was out and we did not know when it was coming back on. Fortunately, my parents had already made coffee! We moved to plan B and cooked the hash in a pan on the grill. It was a happy accident because I loved the crispiness and grill flavor. 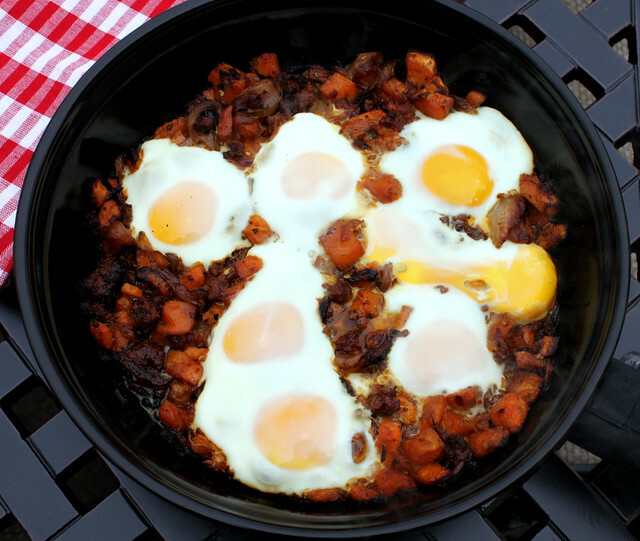 The hash would be great as a breakfast/brunch side dish (actually, it would be good at any time of the day) but it is made into a complete meal by cracking eggs on top. I can’t say enough about this meal. It was so good. 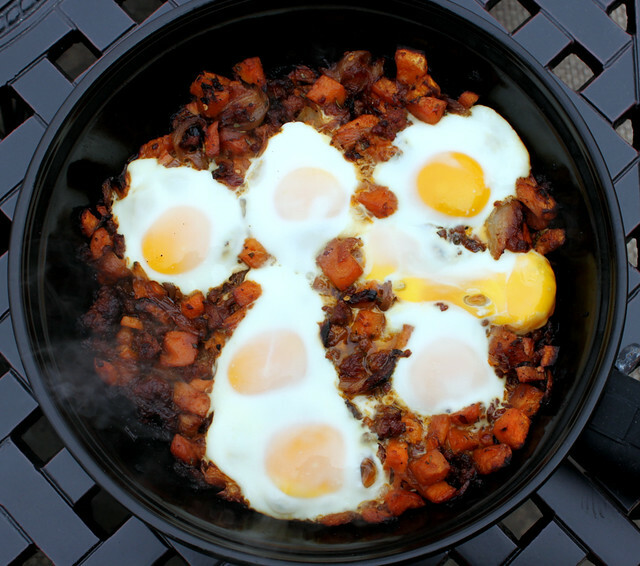 The combination of spicy sausage, sweet caramelized onions and sweet potatoes, and a slightly runny egg was divine. I can’t wait to make this again! We only used a portion of the recipe in the skillet since it makes a large batch. The leftovers were fabulous. For the leftovers we cooked the hash and eggs in the oven in individual ramekins. Melt the butter in a large skillet over medium low heat. Add the sliced onions and sugar to the butter, stir well. Cook the onions until they are soft and caramelized (should be caramel in color), about 40 minutes, stirring occasionally. In another pan, sauté the Italian sausage until cooked through. Drain off and reserve the excess grease. 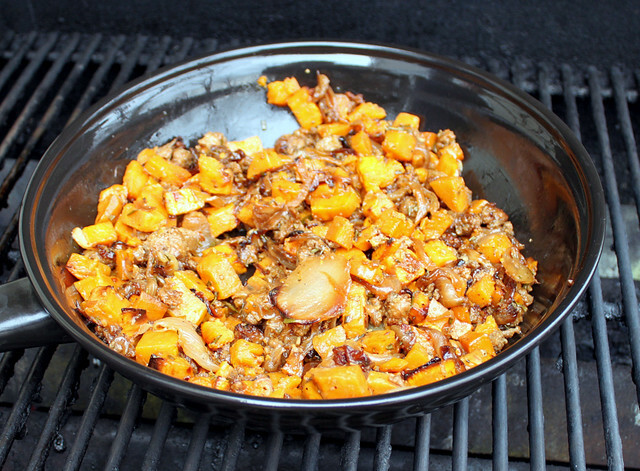 In a large bowl combine the cubed sweet potatoes, cooked sausage, caramelized onions, and garlic. Stir with a spatula and add just enough of the sausage grease to coat the potatoes, about 1 tablespoon. Stir in the rosemary, salt, and pepper. Spread the potatoes onto a greased cookie sheet and bake for 25 – 40 minutes, stirring twice, until the potatoes are cooked through and starting to brown. Allow the hash to cool and store in a container in the refrigerator overnight. 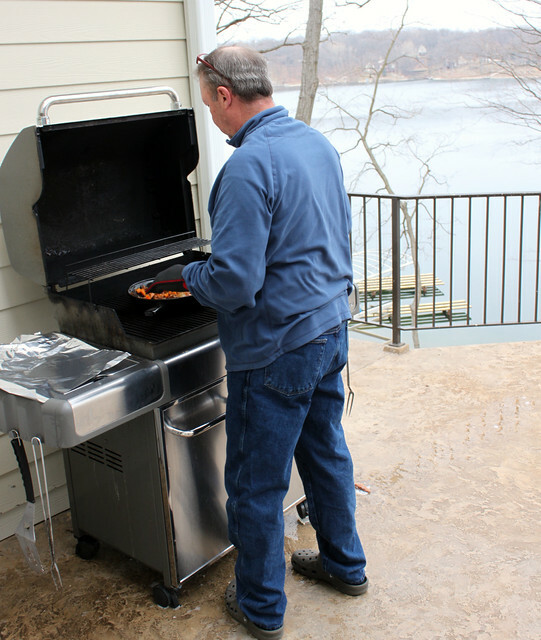 Preheat the grill to medium heat and fill a cast iron skillet with the hash. 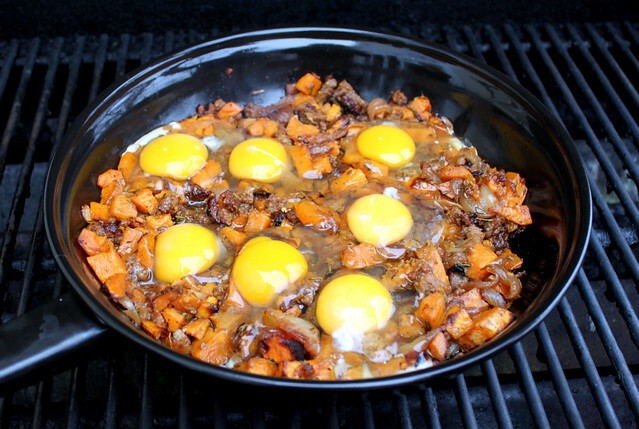 Place the skillet on the grill and cook until the hash is warmed through and starts to crisp up. Make small wells in the hash and carefully add the eggs. Cook until the eggs are at the desired doneness, 5 to 10 minutes. You can also use the oven to bake the hash and eggs in a 9 x13 dish or individual ramekins. I would use a temperature of 425 degrees F.